Lost Jungle is the tenth stage in Sonic Heroes. Descending from the high canopy of Frog Forest into the watery swamp below, the Teams are confronted by the same route-altering megaflora as before, with swing-vines, heli-flowers, and spring-buds galore. A new addition down in the marsh are black storm frogs to go with the green; these giant poison dart frogs summon herbicidal rain that kills the jungle's plants, causing lilly pads and other platforms to wither away under your feet! On occasion this proves useful rather than frustrating; dead stems drop giant bouncing fruits, which can take out enemies as they tumble down slopes. 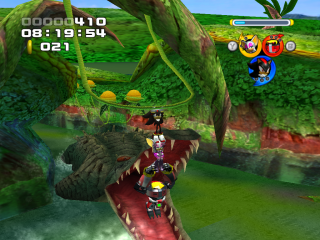 With Team Sonic and Team Dark, there is a giant alligator that lives in the swamp. The level's final section requires quick swinging from vines and get to the Goal Ring before it catches you. 32,000 28,000 24,000 20,000 <20,000 Venture through the deepest part of the jungle! 40,000 35,000 30,000 25,000 <25,000 Explore the deepest part of the jungle! 42,000 38,000 32,000 28,000 <28,000 Escape the jungle! 40,000 36,000 32,000 28,000 <28,000 Rescue 10 Chao! 30,000 28,000 26,000 24,000 <24,000 Get to the Goal Ring within 6 minutes! 14:00 14:30 15:00 16:00 >16:00 Defeat 100 enemies! 3:45 4:30 5:00 7:00 >7:00 Collect 200 rings! 32,000 28,000 24,000 18,000 <18,000 Rescue 20 Chao! This is one of two stages in Sonic Heroes that Egg Pawns do not appear in. The other is Power Plant. Team Rose can also head through the extended method through the level. Jumping onto the extended level's platform is hard since the ivy grows by the goal ring causing them to not pass through the full level. The way to make it to the platform is to use invincibility from their team blast and use Cream to jump off the edge after the loop and before the bounce pad to the half end of the level.